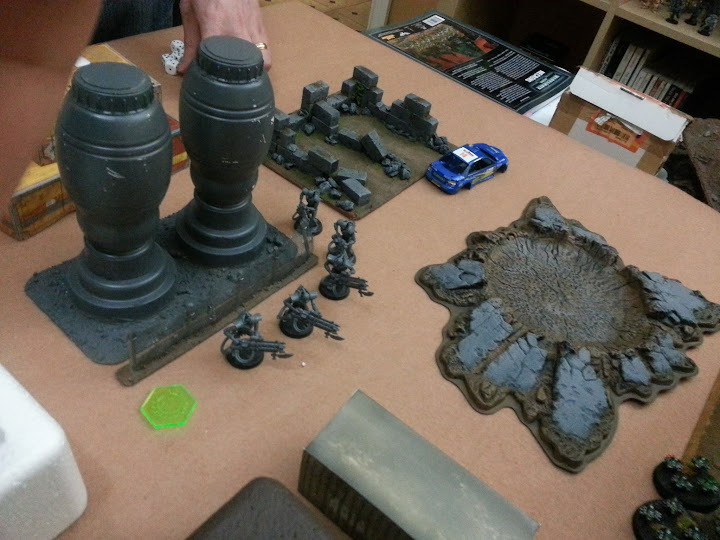 3-way Batrep: Blood Spectres v Necrons v Space Wolves! 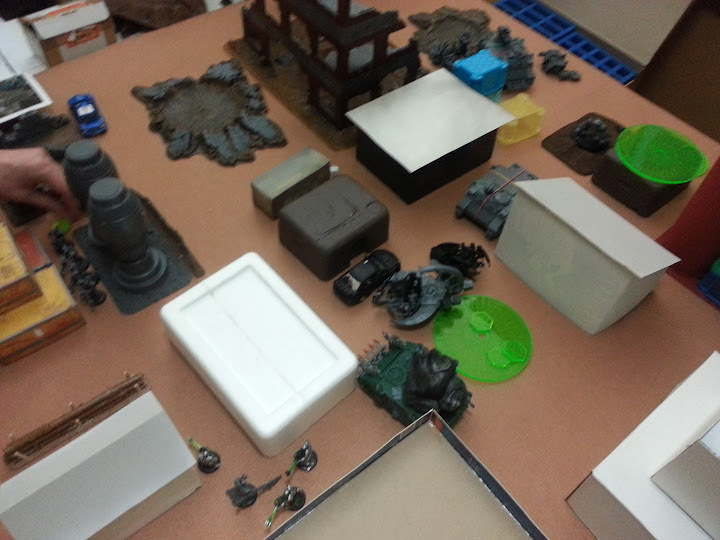 We used a scenario that puts a single 3-point objective in the center of the board, represented by a 5″ blast template. Controlling this would be a 3-point victory point. Troop units could also take away a piece of the loot pile, which would be worth 2 points if it could be returned to the player’s deployment zone. The loot pile would have D3+1 loot tokens in it, rolled when the first unit got into base contact. 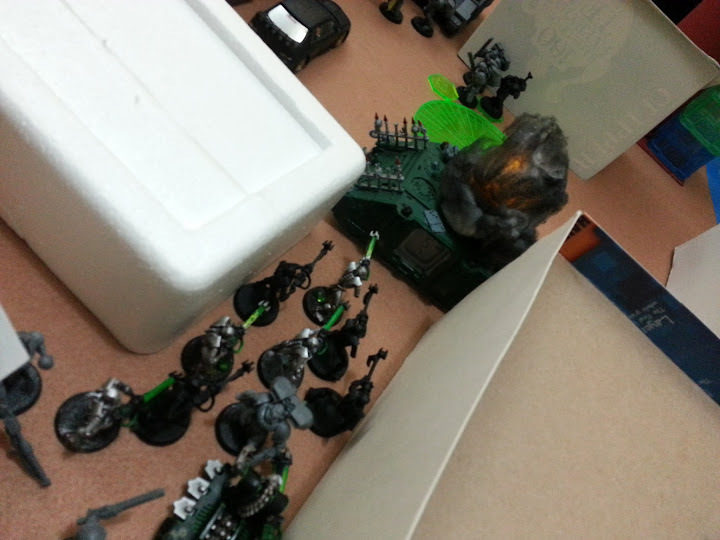 Deployment was quite cramped, with each army starting in a corner of the battlefield. Deployment zones started 2′ from each table corner and went in a triangle shape. 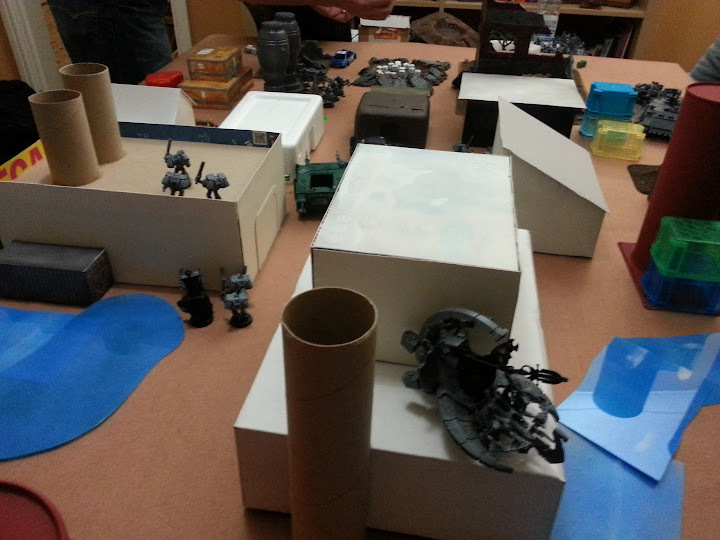 Necrons won the deployment roll-off, so chose their zone first, then Space Wolves, then Blood Angels. The Necrons then chose to deploy and move last, the Space Wolves chose to go second, which left the Blood Angels first to deploy and move. 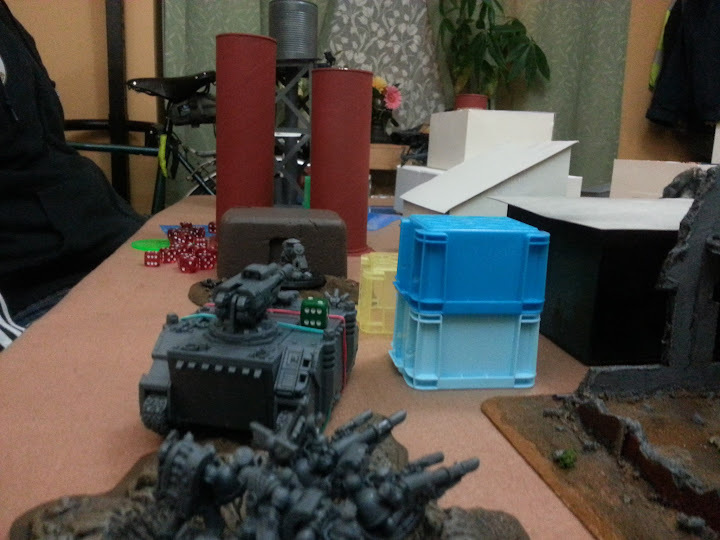 Blood Angels Devastators started on the water tower, giving them line of sight over most of the map. 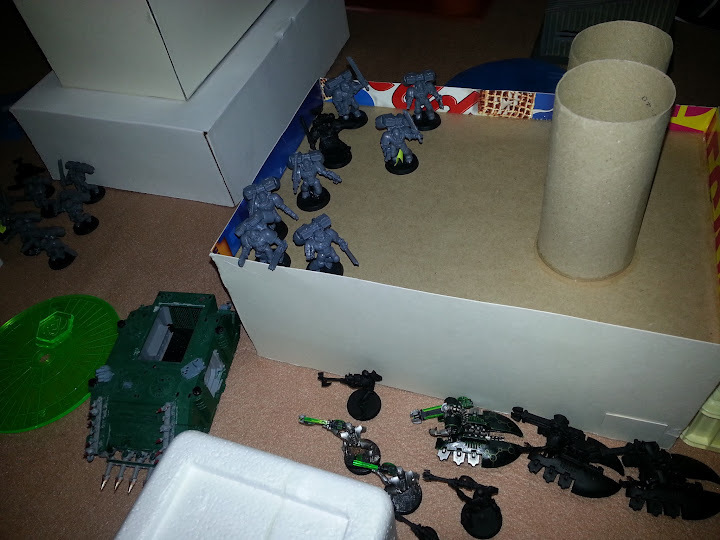 The Assault Marines started on the ground and prepared to use their packs to move forward. Shane also took a Rhino, which he left empty (?) and on his own left flank. The Long Fangs started in cover inside the crater, with the Grey Hunters just behind cover of the ruined corner of the big red ruins. The colorful stripes on the Razorback and Rhino meant they had to start on the Space Wolves left flank (not really, they’re just not glued yet) and the Dreadnought is next to them. The Necrons started behind plenty of cover from the other armies, with the Lord fully hidden away on his Warscythe chariot, next to the Destroyers. Next to them is another lord running with a group of Warriors, who are taking cover with a Canoptek Spider. 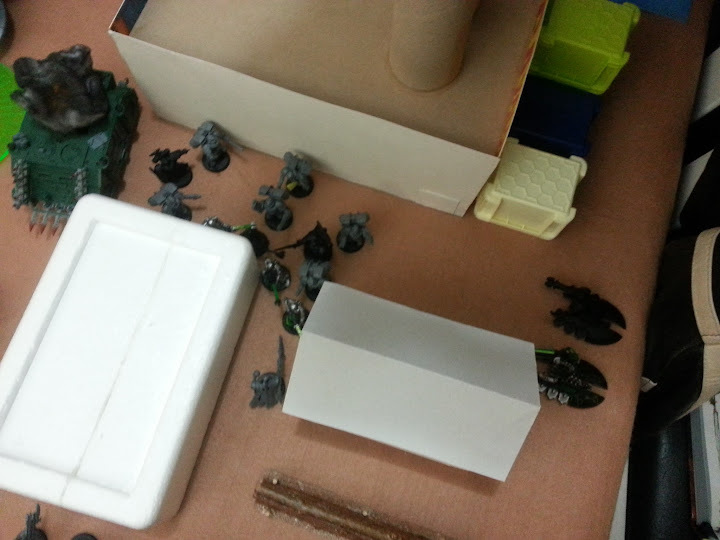 In the small ruins are the Scarab Beetles and next to them are the Immortals with their big scary guns. Nothing else is in range, so let’s fire at our fellow humans! 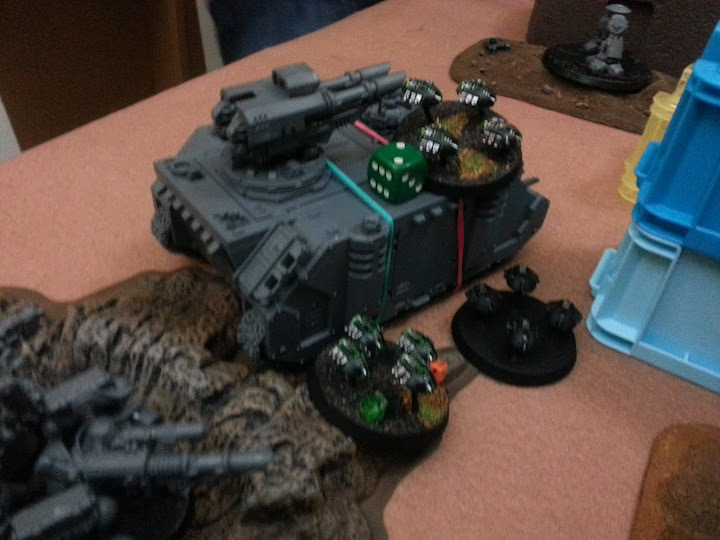 The Devastators ping off the Razorback, not even getting a glancing hit. The Assault Marines jump forward, ready for whatever comes. 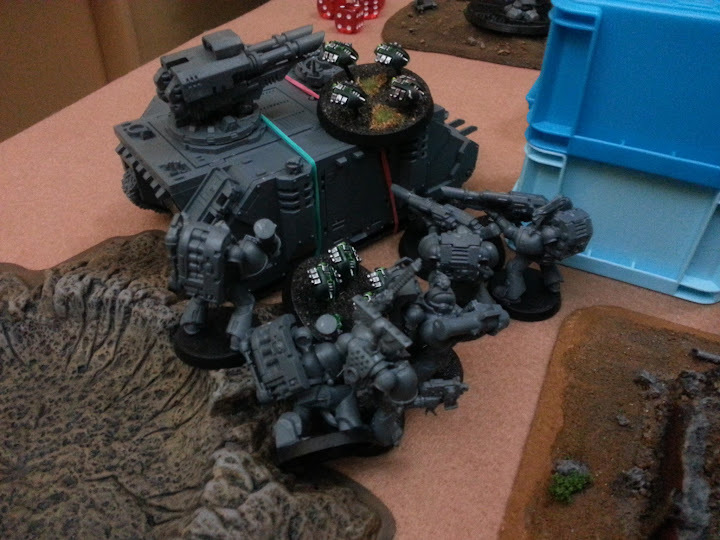 The Space Wolves react by moving the Rhino towards the objective, while the Dreadnought walks towards the Assault Marines. 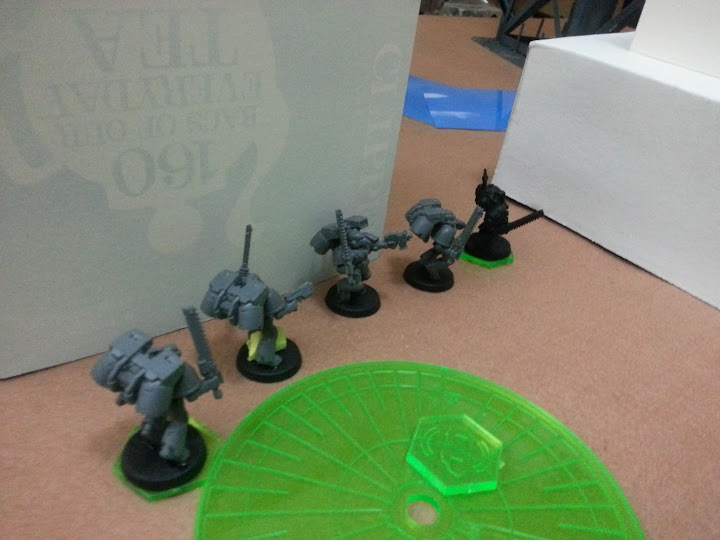 The Longfangs take aim on the Devastators on the water tower. The Grey Hunters fire on the Scarab Beetles, taking one of them down a wound. 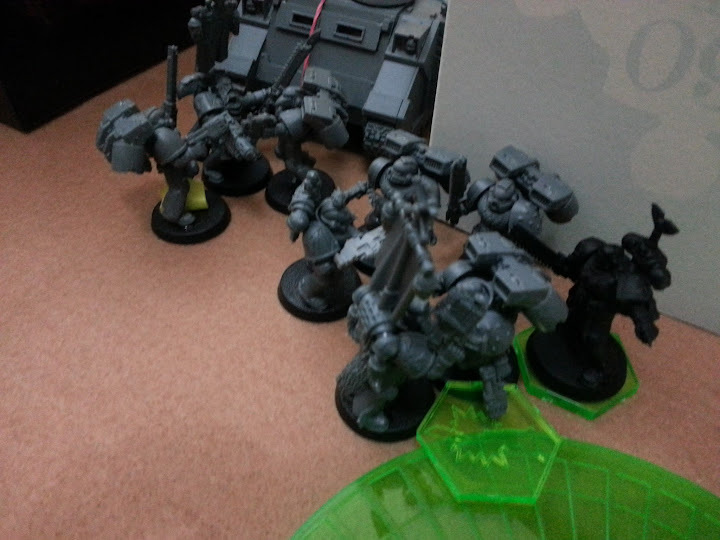 But the 2 surviving Assault Marines don’t, and they jump away, leaving their brethren to contemplate their fate! First Blood (on the Blood Angels) to the Space Wolves! And the Warscythe chariot makes a Sweeping Attack on the Rhino, ending up behind it! He gets two penetrating hits and one miss, knocking it to a single Hull Point! The penetrating hits not only immobilize the Rhino, but its single weapon is also knocked out of commission. 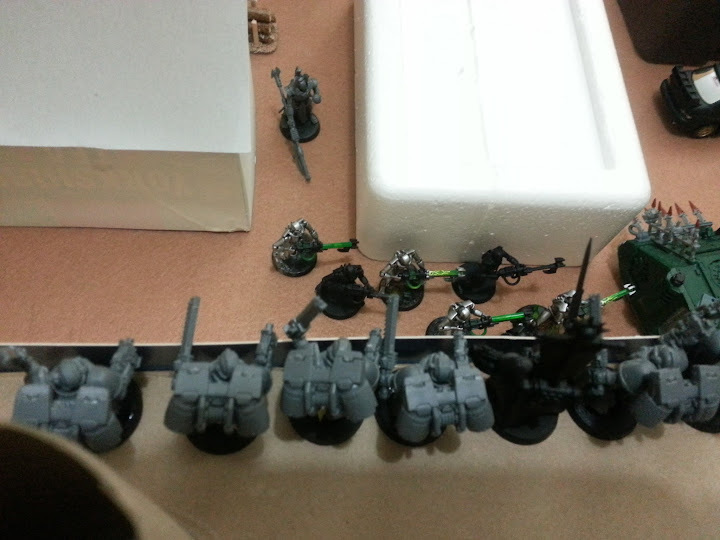 The Necron Immortals open fire on the Grey Hunters, killing 2 of the 7 members of the squad, and they FAIL their Leadership test, running off the edge of the table! First Blood (for the Space Wolves) to the Necrons! 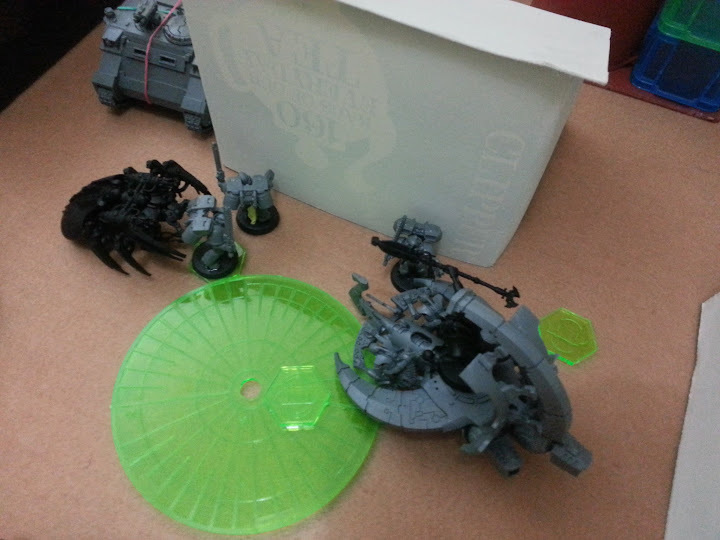 The Canoptek Spider and the Scarab Beetles then assault the Lone Wolf! Maybe they can’t understand the ‘Xeno go home’ graffiti! The Destroyers prepare to fire on anything that gets close to the objective! 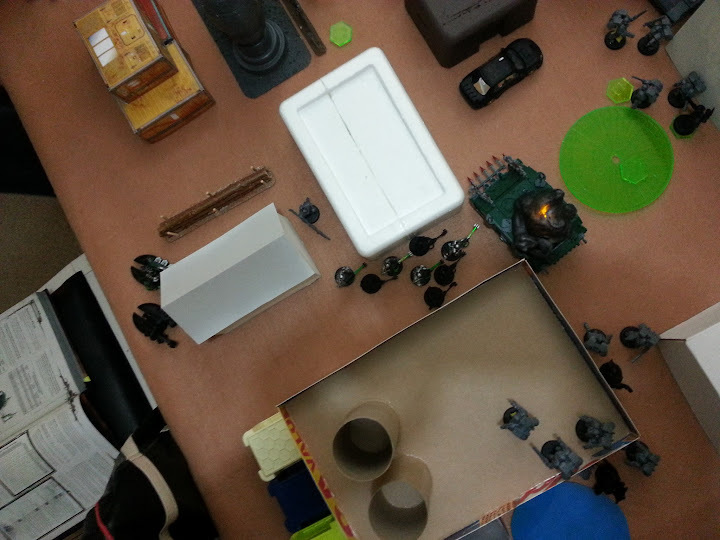 The Rhino moves flat out again to provide cover for the Assault Marines, who move up further up the street. The other squad of Assault Marines use their jump jets to get over the river and get .eyes on target’. The squad of Grey Hunters disembark and move up to grab the first Loot Token! 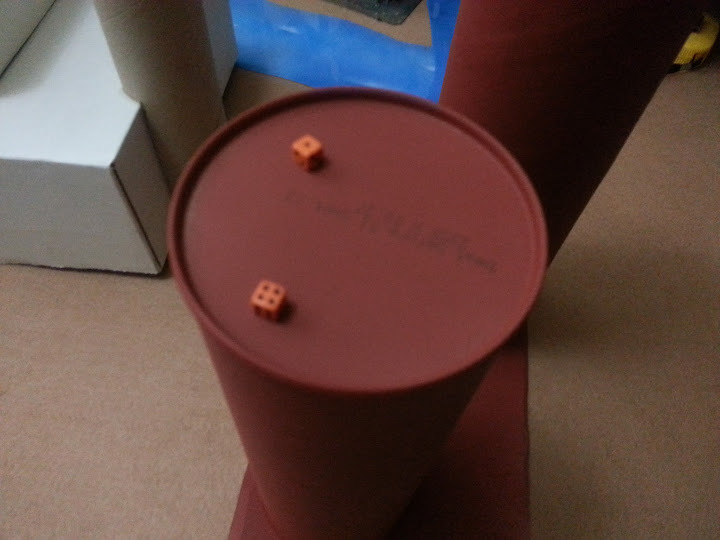 Four loot tokens are rolled, so that leaves 3 loot tokens plus the control of the main objective on the board. The Dreadnought turns to face the Warscythe. It does absolutely nothing to the chariot, and the Longfangs and Razorback fire all miss as well! The Warscythe destroys the Dreadnought! Ba-BOOM! The Warscythe makes a Sweeping Attack on the Grey Hunters, killing a few, then ends its movement next to the loot pile, picking up a loot token – then on its shooting phase it zips off 6″! 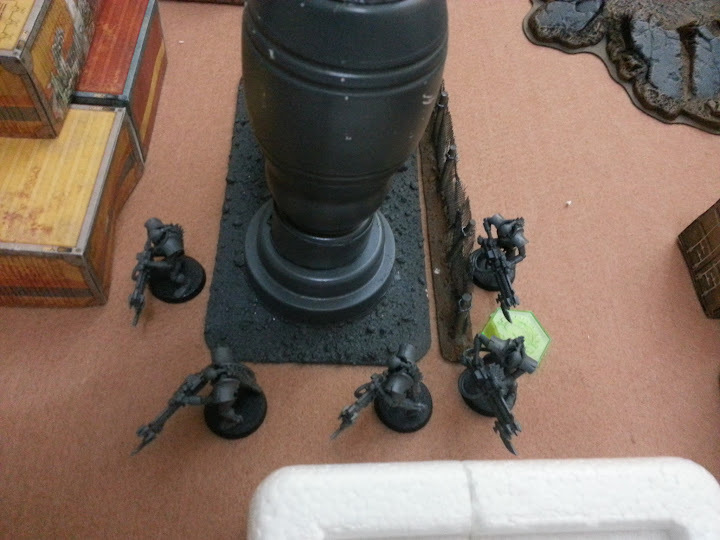 The Necron Warriors continue through an alleyway towards the town square. 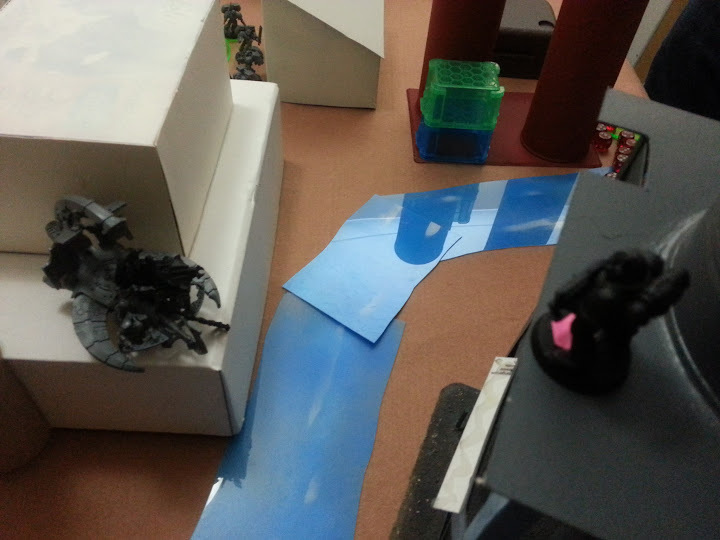 The Scarab Beetles and the Canoptek Spider continue their battle with the Lone Wolf, dropping him to a single wound! The other squad is close behind! The Blood Angels manage to kill just one! The Necron Lord uses his Mindshackle Scarabs, though, which helps force the Marines to jump away in frustration and confustion! 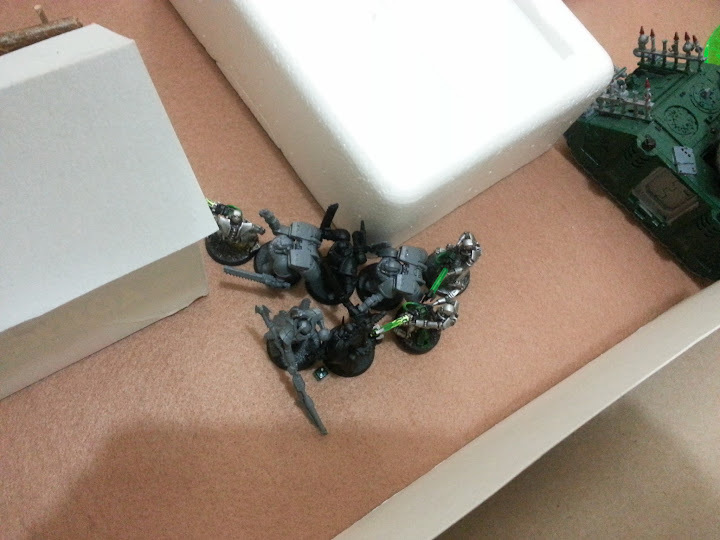 …and kill a couple of the Space Wolves! The Wolves hold their nerve and stay in combat! The Warlord on his chariot skims over the buildings, attacks and misses the Assault Marines on the roof with his Sweeping Attack, and prepares to take aim at the last Blood Angel on the water tower! 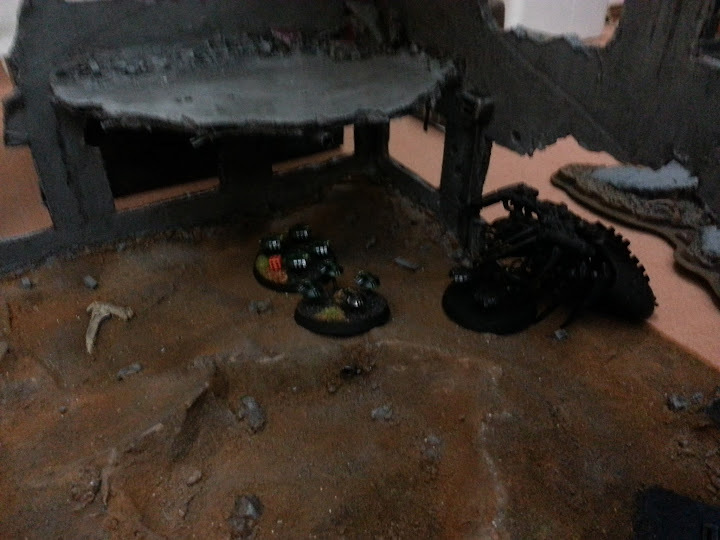 The Lone Wolf finally goes down to the Scarab Beetles and Canoptek Spider! 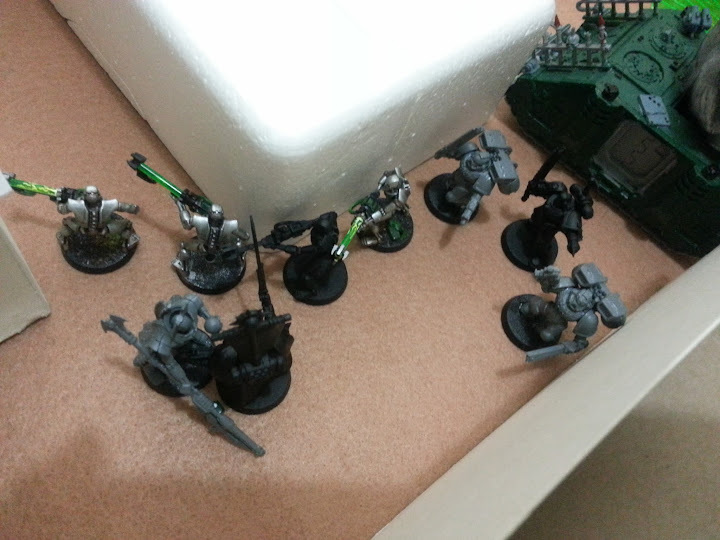 The last complete squad of Assault Marines jump forward and line up, everyone taking shots at the Necron Lord in an attempt to get the First Blood point from the Necrons – that’s right, not a single unit of Necrons has been killed yet! Amazingly, the Lord takes NO WOUNDS! Hoping to get away with 2 loot tokens (4 victory points total), the Assault Marines in the town centre pick up the dropped loot from the Grey Hunter and move out! Three of the Warriors go down! 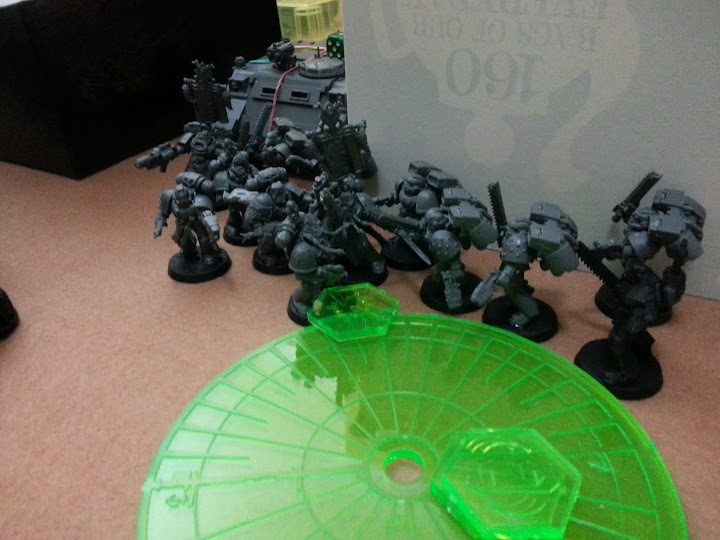 The other squad of Assault Marines jump in, doing Hammer of Wrath – the Warriors bolt and run! PILE IN!! 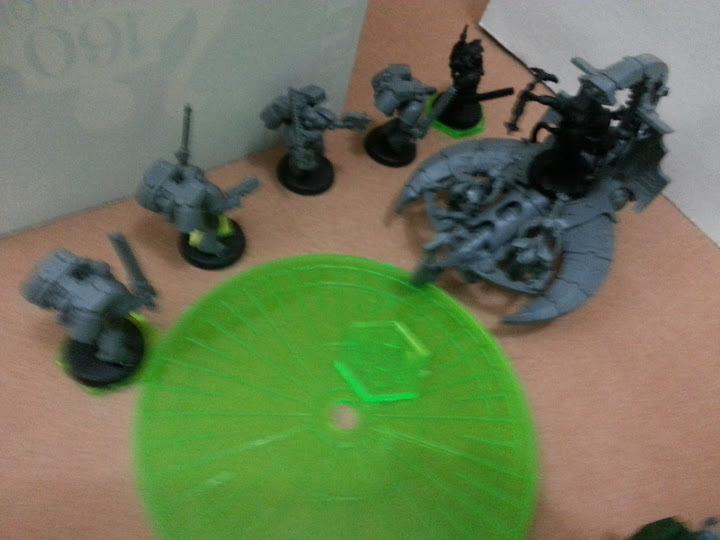 The Razorback takes aim on the Necron Warscythe (behind the white factory to the center left), hoping to take it down once and for all…but miss! 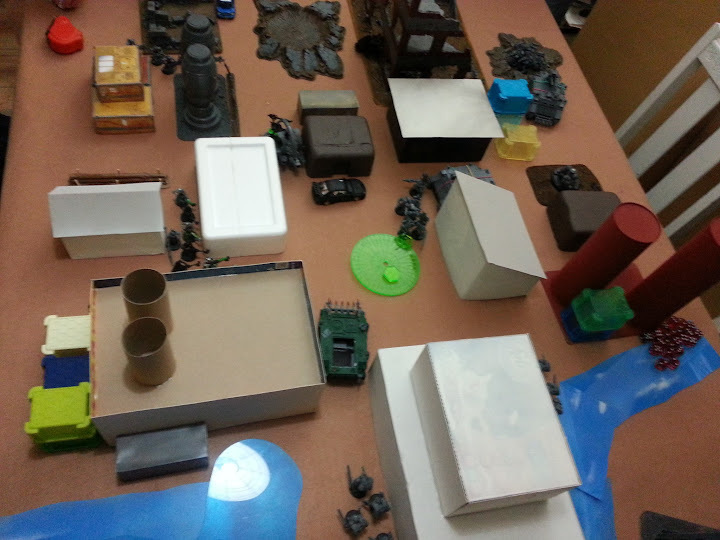 While in the town centre the Warlord arrives and attacks the Blood Angel squad with the loot tokens! 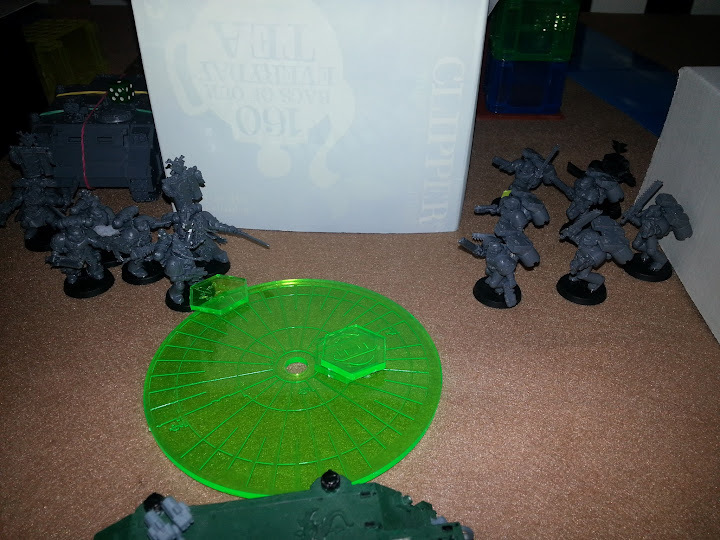 Most of the Assault Marines in the alley are gone now, and the Lord takes on the Sanguinary Priest, mano a mano! The Razorback is bitten down to 2 Hull Points! The Canoptek Spider and Warlord proceed to rip the Assault Marines to shreds – now the central objective is denied and the Blood Angels look like they’re not going to get any points for loot! The Long Fangs desperately try an assault on the Scarab Beetles, but are unable to wipe them out! The Necrons attack and attack some more, and the victory points tell the tale…just one point for the Space Wolves (First Blood on the Blood Angels) but the Necrons had nearly a clean sweep, with at least 4 points! THOUGHTS ON THE BATTLE from Frank: David got a bit lucky with the Warlord Traits roll that allowed him to treat his Warlord as a Troop, otherwise he wouldn’t have been able to pick up the loot tokens he got. He also played it smart going last in a 3-player match, allowing Shane at the other end of the table to antagonize David W and let them get into a shooting match with each other. Then David B got a *big* break by running the Grey Hunters off the board! From then on he had lots of good rolls and no one could knock out his chariot. 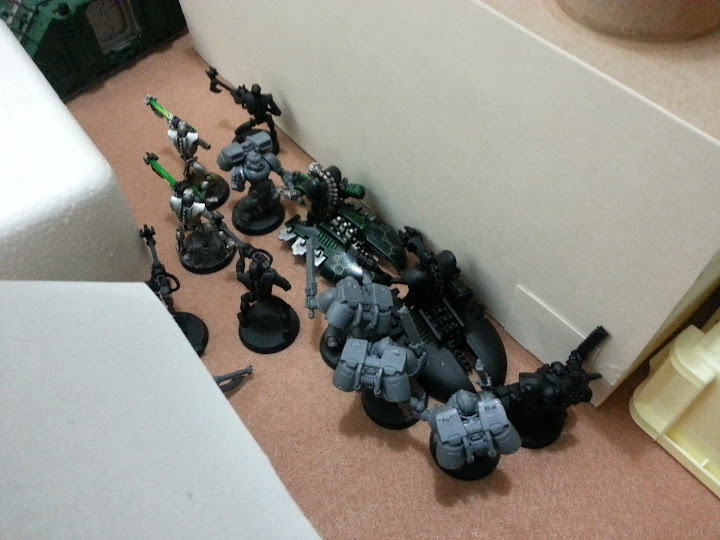 The Marines knew what they were up against facing each other, but the Necrons were a new foe so they didn’t really know how to take care of the chariot zipping across the town and knocking everything out. Shane had a few bad rolls but in my opinion needs more shooty units to combat units like the Necron Lord. David W was boned right from the start, losing most of his troops from a bad Leadership roll. After Turn 1 it seemed like it was just game over for the humans, but maybe a combined effort could have pulled things through for the Marines, you never know. 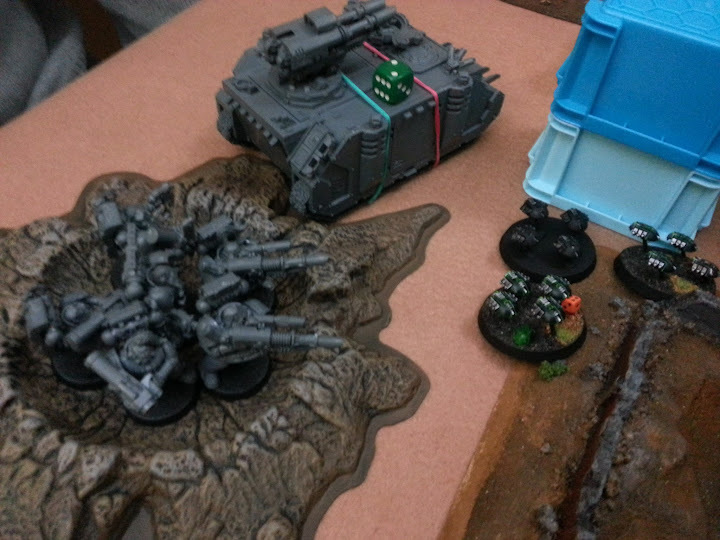 My Unit of the Match: As an observer, I would have to give this to the empty Rhino, who, unloved and unencumbered, trundled up to get in the way of the Necron Warriors to block their way. The Rhino narrowly edged out the Lone Wolf, who kept the Scarab Beetles and the Canoptek Spider occupied for three turns of combat! 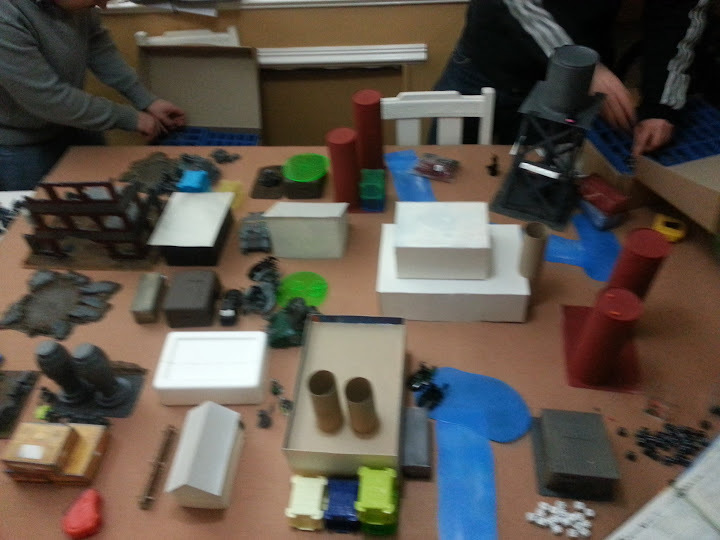 RULES WE MISSED/GOT WRONG: I can’t think of any, apart from the alleyway close combat. Not sure if the Warriors getting back up can be walked over or not. Also we should figure out if a close combat is able to fired into by a 3rd player. Any comments from Shane and The Davids are welcome! Very interesting game, thoroughly enjoyed it. At 1000pts I don’t think taking Devastators as my heavy choice was a mistake, and having such a densely packed battlefield, the high vantage point allowed me to get a lot of shots off pretty early, unfortunately I didn’t get the kills and the Space Wolves did. If i could have changed anything list-wise based on what I know now, I would have taken melta loaded speeders instead of the Devastators. 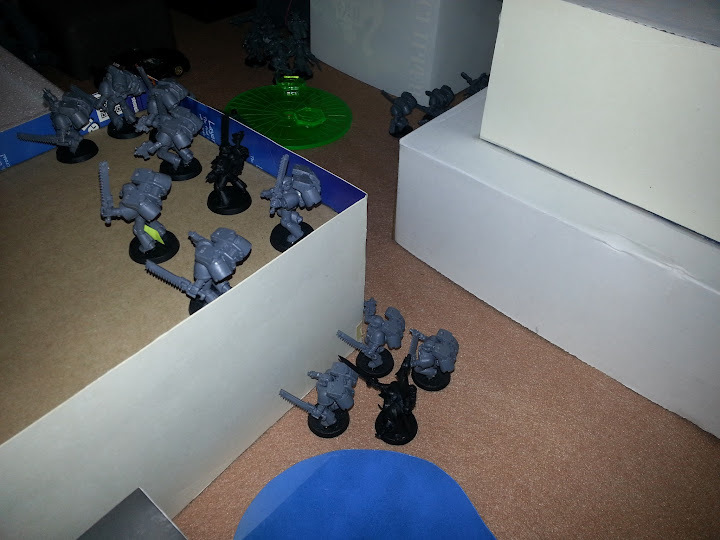 One silly mistake I made was leaving one squad visible to the Space Wolf dreadnought first turn. Big waste. Also rolling lots of 1s and 2s all night didn’t help me! 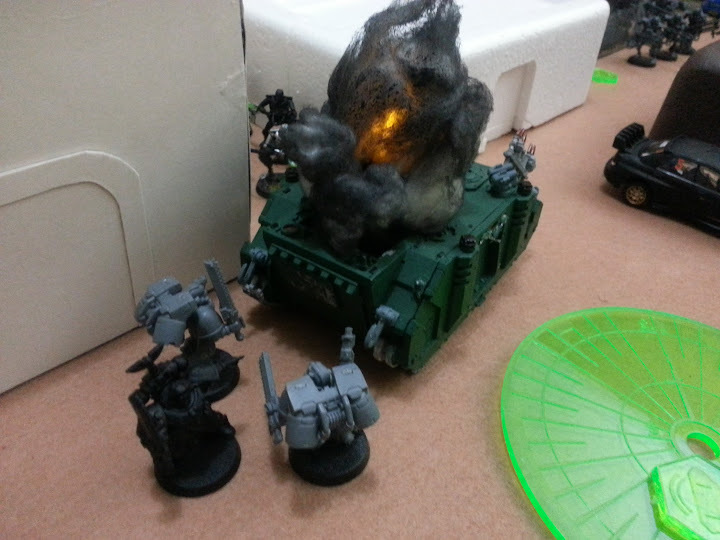 Oh, and the Rhino was for the Devastators, had no idea the terrain was going to be so dense so it went solo instead. Ironically it worked out to be the most useful unit. Anyway, sweet game, cheers dudes! I had some very good luck with the role for traits and the bulk of the Space Wolves force coming at me from the left leaving by stage right! I really liked the scenario. It was actually very even from my point of view. 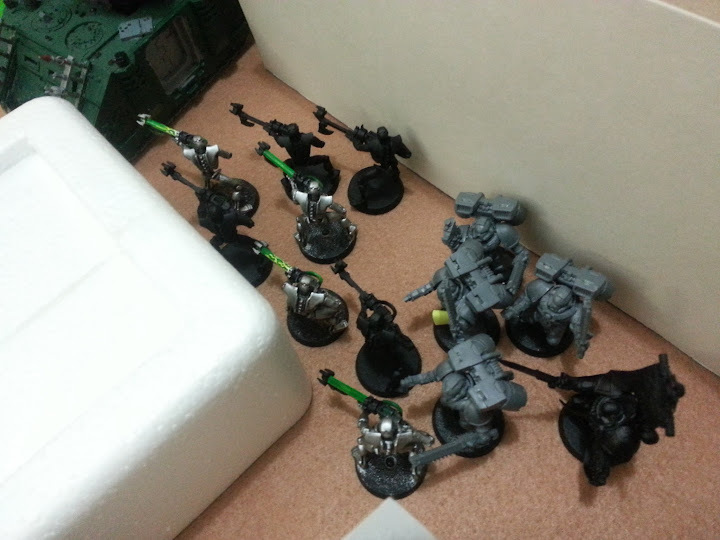 I thought the game was up when the assault marines slammed into my flank. 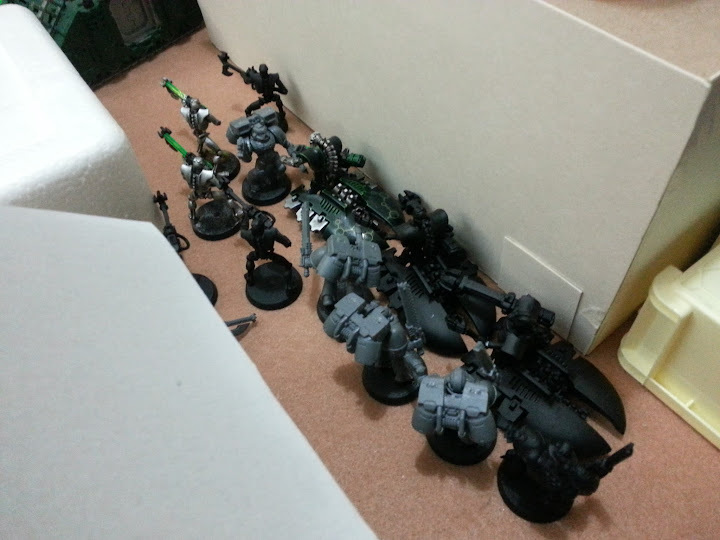 I fully expected the Warrior squad, Destroyers and probably the Lord to be wiped out quickly, with the marines following up into the Immortals. Overwatch was very harsh on Shane and then Lord did alot of damage (plus mindshackle worked again) to save the squads. 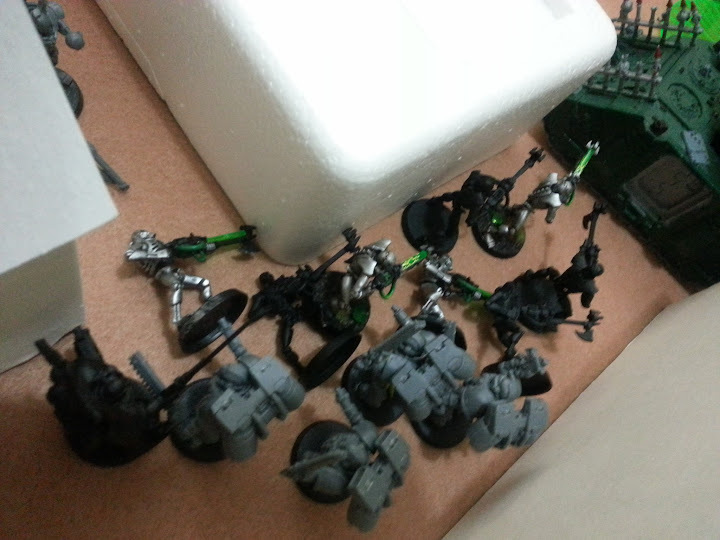 Not being able to kill the last warrior meant I could re-animate his fallen squad mates. One more kill and the half the squad wouldn’t have got back up allowing shane to steam roll that flank. The chariot was fantastic but at 350 points all up with the overlord he needed to be, but if the marines had managed to pen it early on it wouldn’t have been such a thorn in there sides. 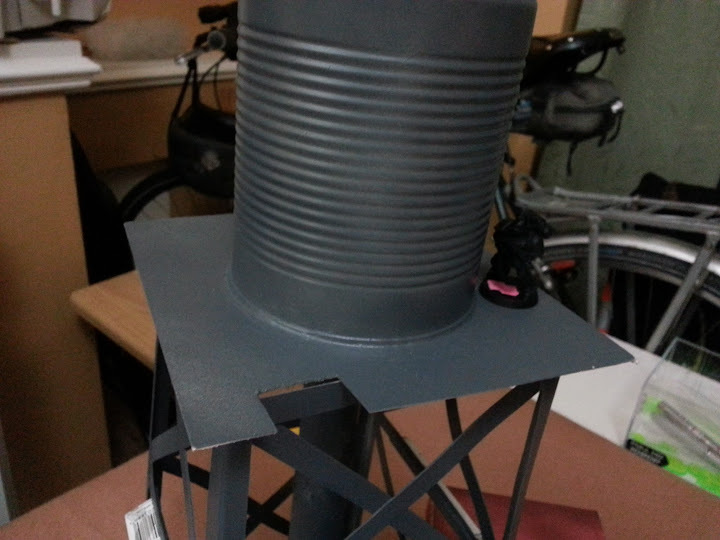 The armour drops from 13 all round to 11 once it’s penned for the first time. I’m sure as the guys get used to seeing them on the table the necrons will be less effective and my rolling can’t be that good all the time! A great game, very exciting and I was glad to get my first proper battle under my belt. Just a shame I didn’t have better luck – it was always going to be tough losing a quarter of my points so early on and without making much of an impact with them – my first mistake was not using the rune priest’s living lightning power before he scarpered! Man of the match for me was definitely my lone wolf – he can really dish out some punishment and was much tougher than I was expecting, I think he must’ve shrugged off a couple of dozen wounds from David’s scarabs & spider beastie! He may have even lasted a bit longer had I realised he had feel no pain when he finally sucucumbed, will try to take two next time! The less said about about the treachery shown by our blood angel brethren the better, but you can be sure the sons of Russell will be avenged, mephiston or no mephiston! 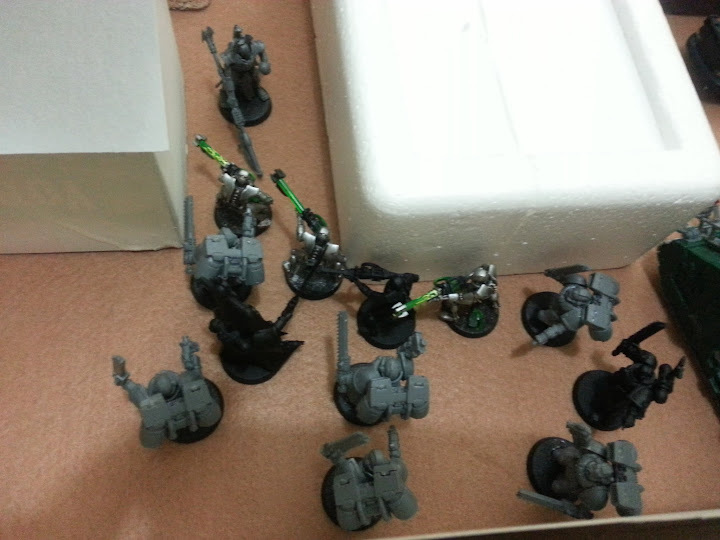 And I thought it was the dark angels I had to watch out for! All in all, learned some good lessons and plenty of ideas for changes to my army and really enjoyed the scenario.